Welcome to the Official Site of Chris Golden, Award Winning Entertainer, Singer, Multi-Instrumentalist, Producer, & TV Host. 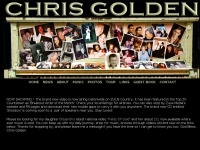 three profiles were found for Chrisgolden.net in social networks. Among other social networks the website is represented in Facebook, Twitter and YouTube. The web server with the IP-address 162.222.176.137 used by Chrisgolden.net is owned by Google Cloud and is located in Mountain View, USA. There are many websites run by this web server. The operator uses this server for many hosting clients. In total there are at least 292 websites on this server. The language of these websites is mostly english.